This work for four dancers and a drummer shook me up no end. It was often loud and often brightly lit. 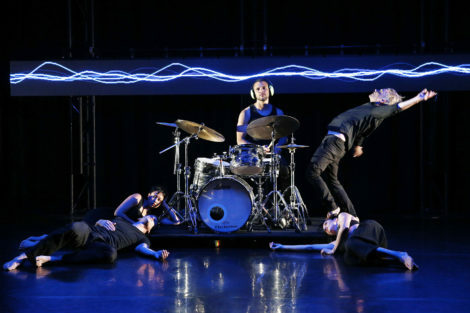 And you might think that the title referred to the fact that one of the dancers, Anna Seymour, was born profoundly deaf, and that the work was made for audiences with differing hearing abilities. Out of Earshot was indeed about the varied ways in which we can communicate, but it was also so much more than that. It was a thrilling journey into the heart of what makes us human. 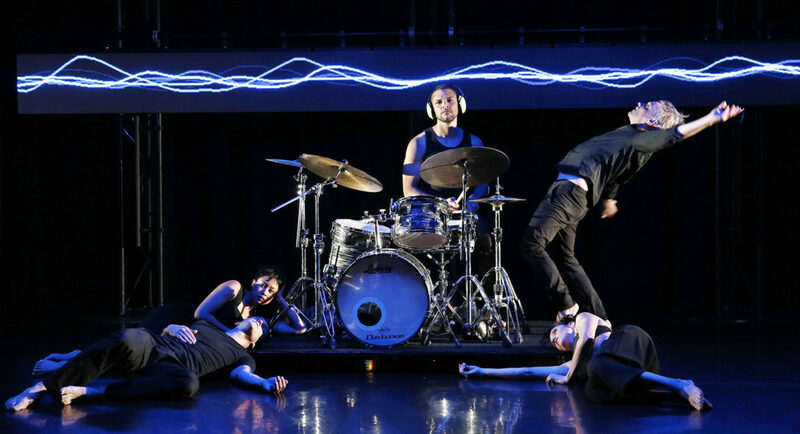 The work began quite gently with just the soft sound of hands tapping on bodies—dancer Elle Evangelista and drummer Myele Manzanza began this exploration of making and feeling sound on and through the body. But once Manzanza, moved from this gentle opening and began to use his mobile drum kit (it was set up on a low platform on wheels), gentle gave way to loud. Manzanza was spectacular to watch because he made music not just with a set of drums but with his whole body, bending and twisting, leaning this way and that as he played. He experimented with making sound in various ways, too, including using his fingers and drumsticks as scraping implements and using the floor as an instrument. Digitised sound waves, reflecting the varying rhythms of Manzanza’s music, were projected in a range of colours onto three rectangular screens (design Paul Jackson, Stephen Hawker and James Paul), and light and colour were significant players over the course of the work. 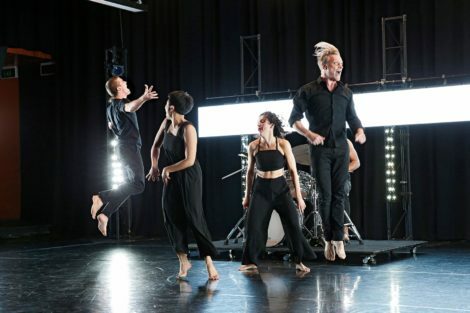 But in terms of the dancing (choreography Kate Denborough in collaboration with the performers), Out of Earshot showed us such a huge range of emotions. There were moments when the choreography had sexual overtones, others when aggression was the dominant feeling—at one stage Gerard Van Dyck stormed across the stage and punched Timothy Ohl in the face, which resulted in an explosive duet between them. There were times when the feeling emanating from the dancing was simply pure love, there were other times when humour surfaced—a joke was shared between Evangelista and Seymour via Auslan (not knowing Auslan myself I have assumed that this was the language being used, but I knew it was a joke as a result of the laughter and giggles that followed). And throughout the work, the athletic capabilities of the body were explored. I especially enjoyed a fluid duet between Evangelista and Van Dyck, filled as it was with rolling and pulling movements, and another between Evangelista and Seymour in which they hugged and snuggled up to each other. So many emotions were there to imagine and the dancers pushed themselves hard to convey those feelings. Denborough and her team also played with silence and stillness. 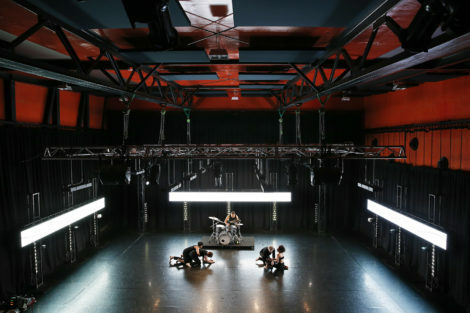 These concepts were sometimes juxtaposed with their opposites, including in a section towards the end of the work when loud singing, shouting, clapping and drumming were followed by a similar sequence without the sound and with just the dancers’ lips moving and the drummer’s drumsticks playing in mid-air. The ending was quiet, soft, slow as the dancers lay on the floor with the lights fading gently around them. It was something of a return to the opening with light touches to the body replacing the powerful movement that characterised much of the middle section of the work. Out of Earshot did show that thoughts and ideas can be communicated in silence, with a lot of noise, with movement and expressive bodies, through visual elements and so on. Fascinating. But it also showed that when communication happens many different emotions are transmitted. That’s what I liked most about the work.